By removing a female mouse's ovary and replacing it with a bioprosthetic ovary, the mouse was able to not only ovulate but also give birth to healthy pups. The moms were even able to nurse their young. "This research shows these bioprosthetic ovaries have long-term, durable function," said Teresa K. Woodruff, a reproductive scientist and director of the Women's Health Research Institute at Feinberg. "Using bioengineering, instead of transplanting from a cadaver, to create organ structures that function and restore the health of that tissue for that person, is the holy grail of bioengineering for regenerative medicine." The paper will be published May 16 in Nature Communications. What sets this research apart from other labs is the architecture of the scaffold and the material, or "ink," the scientists are using, said Ramille Shah, assistant professor of materials science and engineering at McCormick and of surgery at Feinberg. That material is gelatin, which is a biological hydrogel made from broken-down collagen that is safe to use in humans. The scientists knew that whatever scaffold they created needed to be made of organic materials that were rigid enough to be handled during surgery and porous enough to naturally interact with the mouse's body tissues. "Most hydrogels are very weak, since they're made up of mostly water, and will often collapse on themselves," Shah said. "But we found a gelatin temperature that allows it to be self-supporting, not collapse, and lead to building multiple layers. 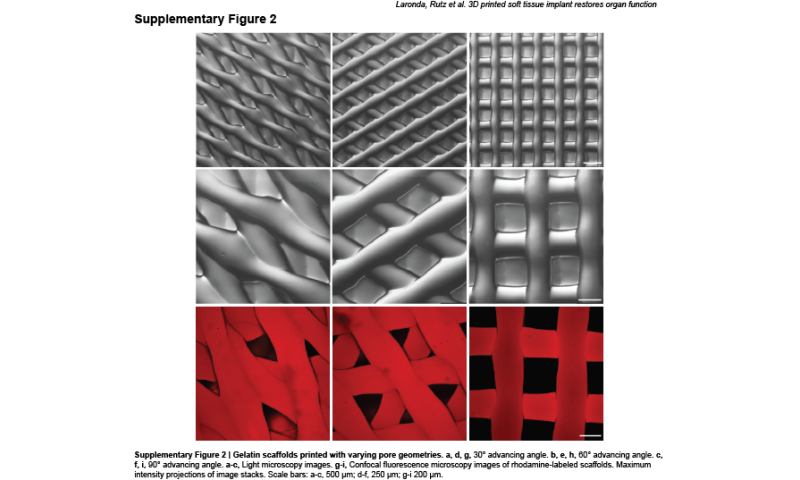 No one else has been able to print gelatin with such well-defined and self-supported geometry." "This is the first study that demonstrates that scaffold architecture makes a difference in follicle survival," Shah said. "We wouldn't be able to do that if we didn't use a 3-D printer platform." The scientists' sole objective for developing the bioprosthetic ovaries was to help restore fertility and hormone production in women who have undergone adult cancer treatments or those who survived childhood cancer and now have increased risks of infertility and hormone-based developmental issues. "What happens with some of our cancer patients is that their ovaries don't function at a high enough level and they need to use hormone replacement therapies in order to trigger puberty," said Monica Laronda, co-lead author of this research and a former post-doctoral fellow in the Woodruff lab. "The purpose of this scaffold is to recapitulate how an ovary would function. We're thinking big picture, meaning every stage of the girl's life, so puberty through adulthood to a natural menopause." Laronda is now an assistant professor at the Stanley Manne Children's Research Institute at the Ann & Robert H. Lurie Children's Hospital. 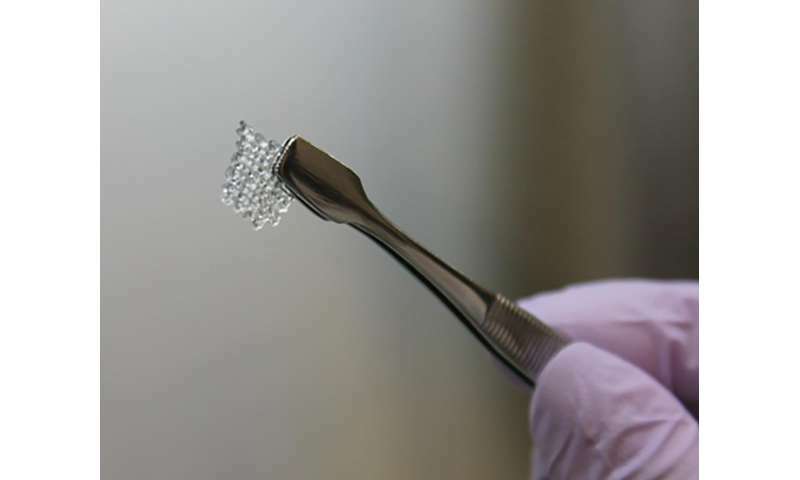 3-D printing an ovary structure is similar to a child using Lincoln Logs, said Alexandra Rutz, co-lead author of the study and a former biomedical engineering graduate fellow in Shah's Tissue Engineering and Additive Manufacturing (TEAM) lab at the Simpson Querrey Institute. Children can lay the logs at right angles to form structures. Depending on the distance between the logs, the structure changes to build a window or a door, etc. "3-D printing is done by depositing filaments," said Rutz, who is now a Whitaker International Postdoctoral Scholar at École Des Mines De Saint-Étienne in Gardanne, France. "You can control the distance between those filaments, as well as the advancing angle between layers, and that would give us different pore sizes and different pore geometries." In Northwestern's lab, the researchers call these 3-D printed structures "scaffolds," and liken them to the scaffolding that temporarily surrounds a building while it undergoes repairs. "Every organ has a skeleton," said Woodruff, who also is the Thomas J. Watkins Memorial Professor of Obstetrics and Gynecology and a member of the Robert H. Lurie Comprehensive Cancer Center of Northwestern University. "We learned what that ovary skeleton looked like and used it as model for the bioprosthetic ovary implant." In a building, the scaffolding supports the materials needed to repair the building until it's eventually removed. What's left is a structure capable of holding itself up. Similarly, the 3-D printed "scaffold" or "skeleton" is implanted into a female and its pores can be used to optimize how follicles, or immature eggs, get wedged within the scaffold. The scaffold supports the survival of the mouse's immature egg cells and the cells that produce hormones to boost production. The open structure also allows room for the egg cells to mature and ovulate, as well as blood vessels to form within the implant enabling the hormones to circulate within the mouse bloodstream and trigger lactation after giving birth. The all-female McCormick-Feinberg collaboration for this research was "very fruitful," Shah said, adding that it was motivational to be part of an all-female team doing research towards finding solutions to female health issues. "What really makes a collaboration work are the personalities and being able to find the humor in the research," Shah said. "Teresa and I joked that we're grandparents of these pups."